Kids can enjoy a whole kingdom of outdoor fun with the Grown Up Scramble 'n' Slide Play Centre. 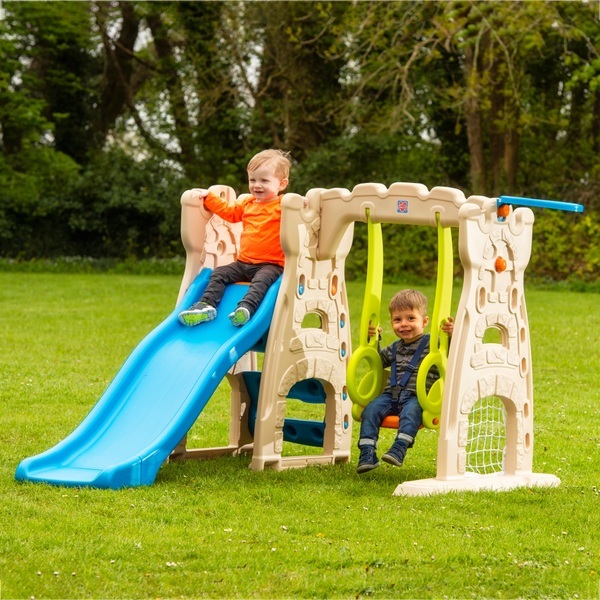 The playful castle theme of this feature-packed swing and slide set encourages children to step into a world of imagination for creative outdoor play. The Grown Up Scramble 'n' Slide Play Centre features a sturdy swing and slide, as well as a climbing wall, a basketball hoop and a football goal. Your little one is sure to enjoy hours of fun whizzing down the colourful slide. The wide and sturdy steps of the climbing wall make it easy for little ones to clamber to the top of the slide with confidence, while the plastic chute has raised sides for safety. The high-back swing seat features a 3-point safety harness, high sides and easy-grip handles to keep tots secure as they rock. The swing seat rests 25.5cm above the ground. This activity-packed play centre is designed to get kids playing outdoors. The Grown Up Scramble 'n' Slide Play Centre even has a brightly coloured basketball hoop and mini football goal at one end to encourage your little ones to try out some sporting basics. (Ball not included with the Grown Up Scramble 'n' Slide Play Centre.) This versatile play centre even incorporates a safe crawl-through space for tots who want to go their own way. This range of fun activities helps to develop kids’ gross motor skills, balance and coordination. Choose the Grown Up Scramble 'n' Slide Play Centre to crown your little one king or queen of their very own castle.